So, here it is... finished! Once again, this was a workshop taught by Kim Beamish. I love her projects- they are such fun stitches. Managed to frame this one myself with a thrift store frame complete with matts that I repurposed and I am very pleased with how it turned out. I will be stitching this again because I messed up several times and want to do it again and get it right. Even with the mistakes I made though - I love it! This is the photo after lesson two is completed. The satin stitch sections are complete and the stitching for the water. Very little left to do! I signed up for an online workshop being taught in Virtual Threads. There are three lessons and this is the work I did on lesson one. The project is a whitework landscape designed and taught by Kim Beamish and I am really enjoying it. Not too much exciting in the first lesson to look at - the sky is done and some outlines for the other portion. I have been working on this embroidered baby quilt for the last six months! I could not believe how much embroidery was on it once I started. It looked so simple with the stamped design and consisted of mostly large cross stitch but it took me forever! I started soon after I found out my son and daughter-in-law were expecting and managed to finish it two weeks after my new grandson was born. My excuse for that is that little Lucas arrived three weeks early so I was actually done before he was expected to arrive. Since I finished this, I am totally immersed in small stitching projects which require me to use my glasses and magnifier and are tiny enough to finish in a couple days - sort of a backlash from this endless stamped embroidery! This is my gorgeous grandson, Lucas. This photo was taken while he was still in hospital. What a sweetie, eh?! He was three weeks old yesterday and Mom and Baby are doing very well. He is a bit tiny because he was early. I am thrilled to be a new Grandma!! I did these rows of stitching awhile back on a round robin piece and said I would use them again. Well, here they are! As sometimes happens in the best of families, occasionally a round robin goes awry. This is what happened last year in a round robin.. One of the participants failed to forward another's piece home to them and after a year of pleas, it appears the original piece is lost for good. This does not happen often but when it does, it breaks my heart. It has happened to me and I know how much it hurts. So, to console the owner of the piece and make it up to her we have started another piece around the rotation again, duplicating as much of the original stitching as we can. I was not in the original rotation so am stepping in in place of the person who failed to send the piece on. I really enjoyed doing this lovely bit of sampler pattern again. It seems like I am getting a few little things done lately - very small things! 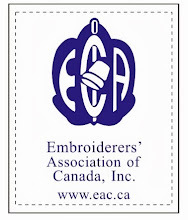 This is a little cross stitch butterfly stitched onto perforated paper. It is part of a larger project that a group of us are collaborating on. The photo does not show that it is done on gold perforated paper so it has a bit more bling factor than it appears here. I can't help thinking they would make nice little pins. 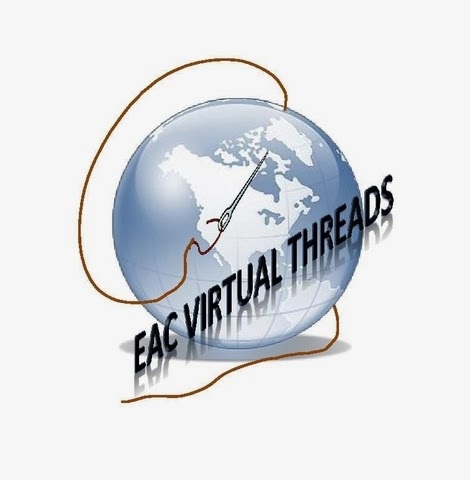 The counted thread round robin I was in on EAC Virtual Threads is done now. I did my work on the last two pieces and received my piece back. These butterflies are what I added on this one. I was a bit disappointed in my contribution to this one. If you click on the photo of the entire piece below you can see all the really lovely techniques that had already been added. Obviously, the theme for this piece was butterflies! This piece had a theme of things you would find in a garden and we were leaving space in the centre for a favourite quote. I added my favourite flowers to this one - a couple of sweet peas. Last but certainly not least, I received my piece back. My theme was Hallowe'en and I was looking for a sampler style piece I could use as a bell pull in my holiday decor. I am very pleased with all the fun motifs everyone embroidered for me. I asked for some space to be left at the top and bottom so I could add some more myself when it came home - have to make up my mind now what to add. It was an enjoyable round robin - challenging at times but I think everyone is happy with their finished pieces. 1. To buy no more stitch supplies unless I need them to finish an ongoing UFO. This may be unrealistic, so I will make a backup - no more than one purchase a month. 2. To work exclusively on UFOs - again slightly unrealistic but I will finish two UFOs at least for every new item I start. 3. MAJOR DE-STASH! This one is already started and there are currently about ten boxes sitting by the front door waiting to go to the Salvation Army Thrift Store when I find someone who will take them for me. I have done in my shoulder so can't carry them myself right now. You know this is serious stuff because there are no photos in this post. I don't believe in posts without photos so if a post is words only they are hopefully words to live by. As I finish the UFOs I will post lots of photos and also ones of works in progress - as soon as I figure out how to stitch with only one arm while hopped up on painkillers. Always something isn't it? !